Golfer's Elbow is a repetitive strain injury, injuring the medial epicondyle. Golfer's Elbow can be caused by an acute injury, or an overuse injury. Most often, Golfer's Elbow is the result of an overuse condition where a specific activity done many times causes a chronic irritation to the tendon. Golf is the most common cause of these symptoms, but many other sport and work-related activities can cause the same condition. Golfer's Elbow is a problem that usually heals with simple treatment methods, and does not cause any long-term problems. Treatment is rarely surgical, as this condition is well managed with rest and cold therapy. Lifestyle changes are important if Golfer's Elbow does not heal on its own, or recurs. With athletes, often altering the swing mechanics can resolve the problem. Ensuring that clubs and grip sizes are sized properly will often alleviate the pain. Anti-inflammatory medications are often used to help control pain and inflammation. The oral forms of these medications are easy to take, and often help control the inflammation as well as manage the pain associated with Golfer's Elbow. Ensuring that anti-inflammatories are only taken when at rest, will ensure that the injury does not get worse throughout the day. Simple stretches and exercises can be helpful in controlling the symptoms of Golfer's Elbow. These exercises should not cause pain, and if they do the exercises should not be done until the pain dissipates. Stengthening the muscles involved with Golfer's Elbow, is the key to preventing the injury from returning. Doctors will recommend this treatment method when all other attempts at healing Golfer's Elbow have failed. Cortisone injections WILL help relieve the pain, but that doesn't mean that the injury has healed. While the cortisone is doing it's job the feeling of pain is gone. Most often when the pain returns, it will be more severe than before and this is because the injury and inflammation has progressed further. 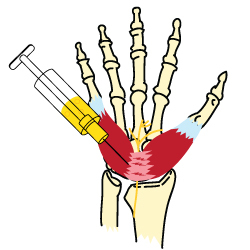 When injecting the cortisone into the medial epicondyle, side effects will include a decrease in the immune system's ability to create white blood cells - lessening the ability to fight infection, susceptibility to bruising, osteoporosis, irritation at the injection site, and possible infection at the injection site due to the immune system supression. The rotator cuff is the group of four tendons and muscles that surround the shoulder joint. When the rotator cuff is injured, it's the tendons of the rotator cuff that are injured. It is these tendons that connect the rotator cuff muscles to the bone. When the tendons are inflamed or torn, they cannot function properly. The most common symptom of a rotator cuff problem is pain. Patients usually complain of pain over the top of the shoulder and arm. In some people, the pain can descend down the outside of the arm all the way to the elbow. Other symptoms are weakness of the shoulder. Weakness causes difficulty lifting the arm up overhead or difficulty with activities such as reaching, getting dressed, or carrying objects. Most rotator cuff tears can be treated without surgery. It is only a small percentage of people who end up undergoing surgical treatment for a rotator cuff tear. Some rotator cuff tears do not heal well with time. They tend to either enlarge, or stabilize in size. The good news is the rotator cuff tears do not necessarily need to heal in order for the symptoms to resolve. Many people have rotator cuff tears, but no symptoms of shoulder pain. Therefore the goal of treatment for a rotator cuff tear is to relieve the symptoms, not necessarily heal the tear. Non-operative rotator cuff treatments may include physical therapy, anti-inflammatory pain medications, and cortisone injections. The goal of treatment is to reduce inflammation and strengthen the uninjured muscles surrounding the shoulder to compensate for the torn muscles while they heal. When the symptoms of a rotator cuff tear are acute, meaning there is a sudden flare-up of symptoms, it may be helpful to rest the shoulder to allow the inflammation of the injury to settle down. It's is important not to immobilize the shoulder, as a condition called frozen shoulder is much more painful than a rotator cuff injury. The way we lift our arm, carry objects, and sleep at night can all place strain on a rotator cuff. Learning proper ways to use the shoulder can place less strain on the rotator cuff muscles. The rotator cuff only accounts for four of many muscles that surround the shoulder joint. Working with a physical therapist, will help learn how to use the other muscles of the shoulder and rely less on the rotator cuff muscles. Physical therapy is the most important step in recovering from a rotator cuff injury. Strengthening the muscles in the rotator cuff, as well as the surrounding muscles will help alleviate and prevent a recurrance of shoulder pain. Anti-inflammatory medications can be helpful at controlling the symptoms of a rotator cuff tear. Anti-inflammatory medications can be taken regularly, under periods where no activity is taking place. Understanding that an injury has occurred and respecting the pain is an essential part of the recovery process. Ice or cold compression therapy can be applied to the shoudler to provide pain relief and to help settle down inflammation. Ice can be applied intermittently as well as after activities that cause shoulder pain. While ice packs can be easily made using household supplies, some people prefer an ice wrap specifically made for the shoulder to allow support, cold and compression at the same time. 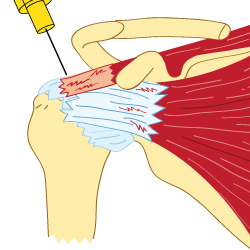 Cortisone injections can be incredibly helpful at limiting the sporadic inflammation of a rotator cuff tear. The problem lies in the idea that it is a quick fix, an easy solution to a problem that take a lot of rehabilitation to successfuly complete the recovery process of a rotator cuff tear. Not allowing yourself to feel the pain will end up in the tear worsening, and surgery needing to be done, as it is very likely to fully rupture a rotator cuff injury if pain can't be felt to know individual limitations. There are many different knee injuries, but meniscus injuries are one of the most common in people of all ages. A meniscus tear is an injury to the shock absorber of the knee joint. 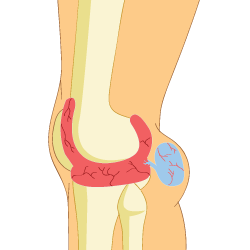 Two types of cartilage are in the knee. The meniscus is a type of cartilage that sits between the thigh bone and shin bone. The meniscus functions to cushion the knee joint and provide stability to the knee joint. A small meniscus tear can be treated with ice application, rest, anti-inflammatory medications, and physical therapy. These simple measures will help decrease swelling and pain in the joint. Depending on the size and type of the meniscus tear, and physical demands of the patient, these may be the only treatments necessary. A cortisone injection can be helpful treatment to reduce inflammation within the joint, but will not help heal the meniscus tear. If these treatments fail to provide relief, a surgical route may be recommended. Physical therapy will help strengthen the muscles surrounding the knee, which is key in relieving pain from a meniscus injury. Physical therapy will help stimulate the blood flow and help speed up the natural healing process. Strengthening exercises will be homework at the end of each physical therapy session to continue working and healing between sessions. Anti-inflammatory medications will help relieve the pain, but should only be used during periods of rest. This will allow your body to tell you whether or not you're further injuring your knee during your daily activities. It's important to listen to your body, as pain is a sign that you're injuring yourself further. Most often, pain is caused by inflammation, and inflammation can be dealt with, with a simple gel pack and a little compression. This technique is called Cold Compression Therapy. It has been proven to reduce pain and inflammation of a knee injury. Quite often cortisone injections are offered too quickly when dealing with knee injuries. Knees, like the shoulder have a lot of muscles, tendons and ligaments that work synergistically to allow your knee to move the way it does. When one part is injured it can be hard for people to function. 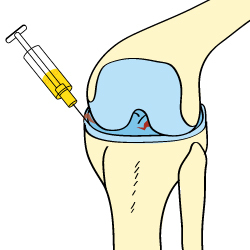 Cortisone injections for the meniscus are inserted into the interstitial fluid of the knee. Cortisone injections in the knee have debilitating side effects. Because the injection has to go deep into the tissues of the skin, most people feel excruciating pain the day after the shots, and people who receive cortisone shots in the knee are at a very high risk for developing arthritis and osteoporosis later on. 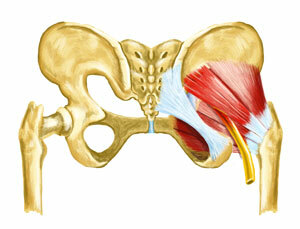 Piriformis syndrome is a common cause of buttock and posterior leg pain. Pain in these areas can begin spontaneously or after an injury. The symptoms are commonly seen in patients with other inflammatory conditions and in patients who sit for most of their work day. 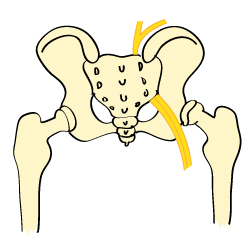 The pain usually begins when the piriformis muscle becomes taut, tender, and contracted. This process causes a deep aching sensation in the midgluteal region that is sometimes associated with pain radiating down the posterior leg or up to the lower back. The tight piriformis may cause a nerve and vessel entrapment syndrome as a consequence of its close proximity to the sciatic nerve and surrounding vessels. Because piriformis pain can be caused by inflammation, the first method of treatment is always to use ice for approximately 20 minutes each session to ensure that swelling or inflammation is not the cause of the pain. Heat therapy will help to relax the muscle. If the muscle is contracted, heat will help to relax it and will help to make the pain subside. NSAIDS will help with the dull ache that's associated with piriformis syndrome as well. When taking NSAIDS remember to take them during periods of rest, to ensure that masking the pain does not cause any injury. While light stretching is not advisable for any soft tissue injury, with piriformis syndrome it will help relieve the tension, which will reduce the dull aching feeling over time. When stretching, be careful not to cause any pain as that will be a sign that you could be causing further damage. Cortisone injections can be used for treatment for piriformis syndrome, but are often avoided due to complications such as infection, bleeding disorders, bruising and sciatic nerve injury due to the location of the injection site for piriformis syndrome. Carpal tunnel syndrome occurs when a nerve is pinched in the wrist. This nerve, called the median nerve, is the connection from the brain down to the finger tips. In patients with carpal tunnel syndrome, the median nerve is pinched as it passes through the wrist. Because of the compression, the nerve does not function properly. The median nerve starts at the spinal cord, and branches down the arm and into the wrist and hand. In the wrist, the median nerve passes through the carpal tunnel. As carpal tunnel syndrome is a repetitive strain injury the RICE method works very well. R stands for REST. Rest is the first step in helping reduce inflammation and start the healing process. Limit movement as much as possible, and the muscles and tendons will quickly start to recover. I stands for ICE. Ice or cold compression therapy is very important to relieve the inflammation in your wrist, and allow the median nerve a little room so it will no longer be pinched. C stands for COMPRESSION. Compression is important to not only restrict movement, but when adding ice at the same time will double it's ability to reduce the inflammation, and relieve the pain. The wrap should be snug, but not cutting off circulation to the extremity. E stands for ELEVATE. In the case of the wrist, elevation will help reduce the amount of blood flow to the extremity, furthering your bodies natural ability to reduce inflammation and heal the injury. Elevate you wrist at night by placing pillows under your arm, keeping it higher than your heart. Injecting cortisone into a tendon or ligament, it temporarily weakens that band until it has time to heal. 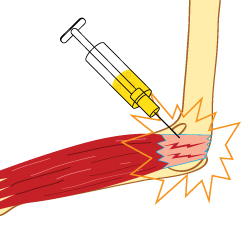 As pain disappears the patient forgets they are injured and continues life as normal, unknowing they could be injuring the injected tendon further. When injecting cortisone into the wrist to relieve pain, there are a number of negative side effects that may occur. They range from insomnia and hot flashes, to infection at the injection site. Most times cortisone shots do not relieve the pain from the patient, and with the cortisone weakening the immune system it's very important to stay away from anyone with a virus, as your body may not be able to fight it. 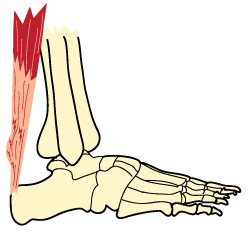 The Achilles tendon connects the calf muscle to the back of the heel. Achilles tendonitis is a condition of irritation and inflammation of the large tendon in the back of the ankle. Achilles tendonitis is a common injury that tends to occur in recreational athletes. Overuse of the Achilles tendon can cause inflammation that can lead to pain and swelling. Resting the painful Achilles tendon will allow the inflammation to subside and allow for healing. A period of rest after the onset of symptoms is important in controlling acute Achilles tendon injuries. With more significant or chronic symptoms, a period of immobilization can help. The length of time of immobilization should be limited to prevent stiffness or muscle atrophy, but can be an effective method of quickly relieving inflammation. A heel wedge can be inserted into a shoe to minimize the stress on the Achilles tendon. These can be placed in both athletic shoes and work shoes. By lifting up the heel of the foot, even by a small amount, a significant amount of force is decreased on the Achilles tendon. By lifting up the heel to relieve force, this means that with exercise and stretching of the calf muscle Achilles tendonitis can easily be alleviated or prevented. The more flexibility the calf muscle has to move, the less force will naturally be placed on the Achilles tendon. Applying ice to the area of inflammation can help reduce inflammation, to make way for the blood flow to help naturally heal the injury. Inflammation is the main cause of pain, and with the inflammation removed a lot of the pain will be alleviated as well. Anti inflammatory medications are used to help the control of inflammation, but should be used only in periods of rest. Pain is a sign of your injury worsening and it's important to listen to your body, not hide it behind anti-inflammatory medications. Injections can be used for the treatment of Achilles tendon problems, but these are generally avoided because of the lack of effectiveness and possible complications. 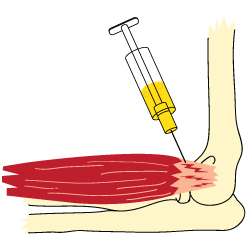 Cortisone injections can lead to possible rupture of the Achilles tendon, and therefore injections are used sparingly in the treatment of Achilles tendon problems. Plantar fasciitis is an inflammation in the ligament on the bottom of your foot. With repetitive use or a hard impact, this ligament may become inflammed and sore leading to a condition called plantar fasciitis. R stands for REST. The first 24-48 hours after the injury is considered a critical treatment period and activities need to be stopped as much as possible. Gradually use the injured foot as much as tolerated, but try to avoid any activities that cause pain. Often crutches are necessary to adequately rest the foot. I stands for ICE. For the first 48 hours post injury, ice the foot 20 minutes at a time every 3-4 hours. The ice pack can be a bag of frozen vegetables, or it can be a reusable gel wrap that provides cold as well as compression and immobilization. E stands for ELEVATION. In the case of the foot, elevation will help reduce the amount of blood flow to the extremity, furthering your bodies natural ability to reduce inflammation and heal the injury. Elevate you foot at night by placing pillows under your foot, keeping it higher than your heart. Cortisone injections are used for the treatment of many different orthopedic problems including arthritis, tendonitis and bursitis. With arthritis being extremely painful and there being no cure or remedy to help heal the pain, it is understood why cortisone injections are used. With tendonitis and plantar fasciitis, using cortisone injections will make it extremely likely for the plantar fascia to rupture completely. Once the plantar fascia is ruptured, the only option is surgery. Tennis elbow, or lateral epicondylitis, is the most common injury in patients seeking medical attention for elbow pain. Exactly what causes tennis elbow is unknown, but it is thought to be due to small tears of the tendons that attach the forearm muscles to the arm bone at the elbow joint. Tennis elbow occurs when there is a problem with the tendons that attach to the outside of the elbow. These tendons are the attachment of the muscles that function to pull the wrist back. Tennis elbow is not simply inflammation of the tendons, but the problem is thought to be a degenerative process as a result of repetitive use. This process occurs when microscopic tears are incompletely healed within the tendon. Changing the way normal activities are performed can be one of the keys to success in treating tennis elbow. Many common activities can lead to the pain of tennis elbow and learning to avoid this pain, even with simple changes in the way things are lifted can lead to a dramatic reducing in the pain caused by tennis elbow. Anti-inflammatory medications can be used in periods of rest. It is important to know the limits during the recovery process, and should never be masked by pain medication. If the pain is respected, the tennis elbow will heal faster. Elbow braces can be worn to help relieve some of the strain associated with tennis elbow. The theory behind using an elbow brace is that it will redirect the pull of the misaligned muscles. Most find relief from pain when using elbow braces to treat tennis elbow. Simple exercises can also be helpful in controlling the symptoms of tennis elbow. These exercises should not cause pain, and those that do should not be done until pain resolves. By strengthening the muscles and tendons involved with tennis elbow, you can help prevent the problem from returning. There are many options for the treatment of tennis elbow. Different doctors and different patients may recommend different treatments. The reason you may hear these differing recommendations is that there is little consensus on what treatment is best, and the scientific research is conflicting. What we do know is that most people will get better with time, regardless of what treatment is used to control symptoms. 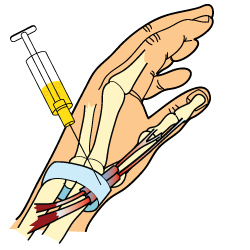 Cortisone injections are used for a variety of orthopedic conditions, including tennis elbow. Cortisone is a powerful anti-inflammatory medication, meaning it helps to control inflammation. The use of cortisone treatment of tennis elbow has been questioned by many, because tennis elbow does not cause inflammation of the tendon. Therefore, treatment of tennis elbow with a medication that reduces inflammation is debated. Sciatica is pain in the lower extremity resulting from irritation of the sciatic nerve. The pain of sciatica is typically felt from the low back (lumbar area) to behind the thigh and can radiate down below the knee. The sciatic nerve is the largest nerve in the body and begins from nerve roots in the lumbar spinal cord in the low back and extends through the buttock area to send nerve endings down the lower limb. The pain of sciatica is sometimes referred to as sciatic nerve pain. It is important with sciatica to address the underlying cause. Physical therapy will work with a lot of cases of sciatica. This helps stimulate blood flow and strengthen muscles around the spine to relieve pressure. A variety of low back conditioning and stretching exercises are also used to help people recover from sciatica issues. Medications have been prescribed to help with the treatment of sciatica. Pain relievers such as ibuprofen and naproxen are prescribed to help relieve inflammation and pain. Muscle relaxants are also effective for a lot of cases as relaxing the muscles will help unpinch nerves where they are being pinched. Antidepressants have also seemed to work in a select group of patients. The purpose of antidepressants is to reduce the pain perception in the brain. The best reason to have an epidural injection is not for the relief of back pain, but rather for the relief of leg pain caused by spinal nerve compression. Sciatica often causes leg pain due to irritation of the nerve caused by disc herniations or spinal stenosis. We all know very well, that general low back pain symptoms are not well treated with an epidural steroid injection, and this should be avoided as a treatment for this type of pain. Back pain is not a good reason to have an epidural injection. A Baker's Cyst occurs when the bursa (small sac filled with fluid) in the back of your knee becomes irritated and inflamed. This irritation is often caused by an underlying knee injury or condition, such as a Meniscus Tear or arthritis of the knee. This underlying injury or condition causes the bursa to produce too much fluid, leading to inflammation. Baker's Cysts can bulge out the back of the knee, but not all do. Rest, Ice, Compression and Elevation can help to relieve symptoms related to Baker's Cysts. Rest will prevent further irritation. Ice and Compression will relieve pain and control swelling. Elevation works to bring down inflammation. Addressing and treating the underlying condition is probably the most effective Baker's Cyst treatment. If your underlying knee injury is a Meniscus Tear, there is a much greater chance that the cyst will go away once you've healed the tear. Non-steroidal anti-inflammatory drugs such as ibuprofen and naproxen can be used to provide temporary pain relief. However, these should only be used during times of rest and should not be used during physical activity. Some forms of physical therapy can be effective in treating a Baker's Cyst. This could include strength and range of motion exercises, along with massage, taping and cold compression. Draining the fluid from your Baker's Cyst (aspiration) can cause the inflammation to go down, but there's no guarantee that the cyst won't come back. Cortisone can be injected into the back of your knee to help relieve the pain of your Baker's Cyst. This may be effective in the short-term, but it doesn't do anything to address the cyst itself. It only provides symptomatic relief. At the end of the day, the cyst will still be there. Also, it's not advised to have more than 3-4 injections of cortisone into a joint in a year. Frozen Shoulder occurs when the capsule surrounding the shoulder joint becomes thickened, causing pain and stiffness. While the exact cause of Frozen Shoulder is not truly understood, it is often seen in people who have had their arm immobilized due to a medical condition or procedure. It is also associated with conditions such as diabetes and heart disease. Physical therapy is a common treatment for Frozen Shoulder. This will likely include exercises to improve your shoulder's range of motion. Shoulder manipulation can prove effective in some cases. You will be put under general anesthetic and a doctor will physically manipulate your shoulder joint by moving it in different directions to loosen it up. Painkillers such as ibuprofen and naproxen are often taken by those suffering from Frozen Shoulder to help relieve pain and inflammation. While surgery for Frozen Shoulder is not common, it is an option. This would involve the removal of the inflamed, thickened portions of the joint capsule. If over-the-counter pain medications are not strong enough for someone with a bad case of Frozen Shoulder, a cortisone injection may be recommended. 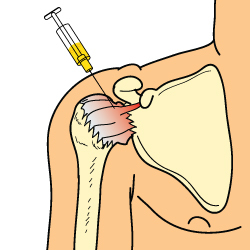 Cortisone injections into the shoulder are risky as they can lead to permanent tissue damage. They also only provide relief temporarily and don't do anything to resolve your Frozen Shoulder. What is De Quervains Syndrome? De Quervain's Syndrome is an RSI (repetitive strain injury) that causes the tendons below the thumb to become swollen and painful. When the sheath surrounding the tendons becomes thickened from overuse, the tendons inside can't move as smoothly as usual. De Quervain's Syndrome is commonly seen in sports such as tennis and golf. It's also prevalent among new mothers, which is thought to be caused by lifting the baby. The RICE method can be effective for relieving your symptoms. By resting and avoiding activities that may aggravate your wrist, this will prevent further irritation of the tendon sheath. Icing the wrist will help with pain. Compression works to relieve your swelling. Elevating your wrist will bring down inflammation. Splints are often used in cases of De Quervain's Syndrome to help immobilize the area. The goal of immobilization is to avoid further pain and injury. NSAIDs (non-steroidal anti-inflammatory drugs) such as Advil and Aleve can be taken to help relieve pain and swelling. These should be limited to times when your wrist is at rest. Using painkillers during physical activity can lead to permanent tissue damage. If conservative treatment doesn't solve the problem, surgery is an option. Surgery for De Quervain's Syndrome will involve the tendon sheath being opened up more to stop the compression on your tendons that's causing the pain. 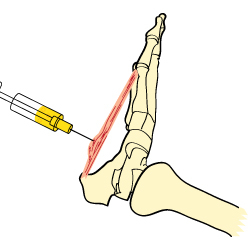 Cortisone can be injected into the tendon sheath to help alleviate pain and swelling. While a corticosteroid injection can help in some cases, it also comes with a wide variety of risks. This includes bone death (osteonecrosis), tendon rupture, skin discoloration and infection. The King Brand forum is a great place to research specific ailments and to figure out whether or not BFST and ColdCure products can help. Their treatment advisors are constantly posting on forums to help educate people on how to heal their injuries. If you can't find the answer you're looking for, then feel free to take part in their forum by registering. Just below, is a prime example of the quality customer service that King Brand provides on a daily basis. This is the perfect online community that will help educate, heal and get you back on your feet in no time.